A few months back, Google announced its new Google Wallet service which aims to scrap the traditional idea of having credit cards and money in a physical sense by tucking them away all inside a tiny icon on your smartphone. As of today, owners of a Nexus S 4G on the Sprint network will be the first to have the opportunity to try the new service out, which the big G stated on its blog lets you, "tap, pay and save using your phone and near field communication (NFC)". The app has, as you would expect, undergone extensive testing in prep for the release, and is compatible with Citi and MasterCard, with American Express, Visa and Discover all set to join the party in future updates. In addition, you can opt to use the Google Prepaid Card, which you can top up using any existing credit card (Google will also throw in $10 as a "thank you" to early adopters if they set up a Prepaid Card before the end of the year). "Our goal is to make it possible for you to add all of your payment cards to Google Wallet, so you can say goodbye to even the biggest traditional wallets," continues the post on the Big G’s official blog page. "This is still just the beginning, and while we’re excited about this first step, we look forward to bringing Google Wallet to more phones in the future." It remains to be seen whether the idea of amalgamating the wallet and the smartphone will be met with a positive response. It’s not as if we don’t buy things on eBay or Amazon on the move, but such technology does pumps up the ante somewhat. Whether we like it or not, with the way technology goes, it is almost inevitable that some time in the future, it will be the norm, and those still carrying wallets will be as abnormal as those who still use dial-up connections; or MySpace. Still, it will be interesting to see if consumers jump straight onto it, or if they have to be dragged through kicking and screaming. 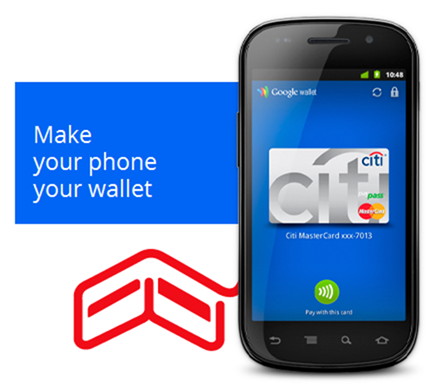 For more details, check the official Google Wallet page.